Efficient practice makes a huge difference to your enjoyment when playing an instrument. Imagine you could make three, four, five or even ten times as much progress on your instrument as you do now... and all in the same amount of time or even less! Well, you can. All you need to do is follow a few simple rules and you will find yourself progressing much faster with more efficient practice and achieving your musical goals in much less time. 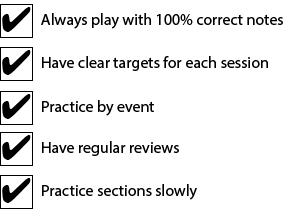 You will find this site full of ideas for making your practice more efficient. Don’t try and use them all at once though! Improve your practice habits one step at a time. If you try and change everything all at once you are likely to fail. Take it one step at a time. Change a few elements of your practice routine every few weeks. This will help ensure your success! Think about it: if you formed a new positive practice habit every two weeks, within two and a half months you would have revolutionized your practice! Not a bad return for a two and a half month effort! Especially since your practice would be more efficient meaning you would be learning a lot more music! Look at the Top 5 habits of effective music practice below. Click the links to find out more about each habit and start applying them to your practice gradually. It won’t be long before you notice a huge difference. These are the top habits to acquire but there are many other techniques to make your practice more efficient. Browse the site to find out more but remember: one step at a time! Don’t try to apply them all at once.